Imagine taking a trip from LA to San Francisco in 21 minutes! While it might sound too incredible to be true, in 1972 scientists publicly stated that it could be built and it should be built. The following is a quoted article that appeared in the Los Angeles Times newspaper on June 11, 1972. It is an interview with the RAND Corporation's lead physicist, Dr. Robert M. Salter about the benefit of constructing an underground Very High Speed Transit (VHST) system across the United States. It describes the economical and environmental benefits of subterranean transportation and states that traveling at such amazing speeds can be achieved using conventional (1972) technologies. Think About It: Our government's planning for Continuity Of Government (COG) includes underground bunker facilities located across the United States. It only stands to reason that the planners would have also considered how their supply lines could be protected from airborne attack. Someone involved in the planning, after reading the following article, would have realized that an underground VHST tube shuttle system would be perfect for protecting the distribution of vital personnel and supplies under an American Battlefield landscape without risk or interference. If military strategists knew such a remarkable system could be built, not building it and leaving our national transportation infrastructure above ground, vulnerable to damage by military attack or natural disasters, would be neglecting national security objectives. It's been over thirty-five years since this concept was first made public. I believe it is time for the Shadow Government to turn over the main lines to the surface population. If rumors are true, the Black Ops could begin using their hidden, "backup" tube shuttle systems full time instead. "L.A. to N.Y. in Half an Hour? A Rand corporation physicist has devised a rapid transit system to get you from Los Angeles to NY in half an hour for a $50 fair. He said existing technology made such a system feasible and so does a cost analysis. The essence of the idea is to dig a tunnel more or less along the present routes of U.S. highways 66 and thirty. The tunnel would contain several large tubes for East West travel of trains that float on magnetic fields, moving at top speeds of 10,000 mph. Passengers would faced forwarded during acceleration, backward during deceleration. According to R. M. Salter Jr. head of the physical sciences department at Rand, the idea of high-speed train travel using electromagnetic suspension was first put forward in 1905 and actually patented in 1912. The trains he suggested now would be single cars rather than actual trains, and would be big enough to carry both passengers and freight, including large containers and automobiles. In the first place, he explained there is the extremely important matter of the use and conservation of immense amounts of energy needed to move the vehicles at such great speed. "An airplane that travels faster than sound uses up a large part of its available energy supply just in climbing to an altitude where the speeds for which it is designed are possible." Salter said. "That's true of rockets to. Much of their energy is spent and lost forever and getting above the atmosphere." This would not be true for the VHST gondolas traveling on their electromagnetic rail beds, according to Salter. The tubes would be emptied of air, almost to the point of vacuum, so the trains would not need much power to overcome air resistance. They would not even have to be streamlined. In addition to an electromagnetic roadbeds, the opposing electromagnetic loops of wires in the floors of the gondolas would be super cooled with liquid Helium to further eliminate electrical resistance. Just as important, the gondolas would, like old-fashioned trolley cars, generate power as they break to a stop. "Since the trains would be leaving New York and Los Angeles simultaneously every minute, the power generated by cars breaking coming into the terminal would be transferred to the power lines propelling the cars going the other way." "For example, there will be halfway points between each stop. Trains would use power and getting to that halfway point, and generate power going the other half of the way to the stop. Each would use power generated by trains going in the other direction." That is the way trolley cars have operated for eighty years - taking power from the overhead lines while accelerating or running along at a steady speed, and putting power back into the lines while breaking or coasting. The big drawback to the Salter scheme is the cost of tunneling across the nation. He admitted that it would be expensive but it does not daunt him. "After the tunneling was finished, everything else would be practically free." He said. Even at the low fair he proposes, the enormous debt created by the tunneling would be amortized within a reasonable period if the number of passengers and the amount of freight came up to Salter's expectations. 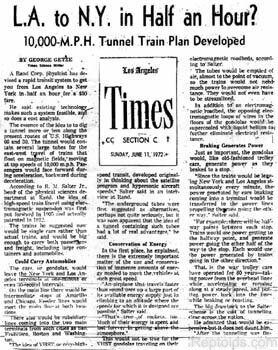 He figures the tunnel's would carry seven or 8 million tons of freight a day and that passengers would take to traveling back and forth between the Eastern West Coast has readily as they now fly between San Francisco and Los Angeles. "The technology of this is much easier than was developed for the space program." Salter said. And tunnels, he added, need not be so expensive to dig is people think. The most expensive thing about surface routes is the acquiring right-of-way and removing buildings that stand on the chosen route. The tunnel would not incur this expense. The tunnel, besides carrying tubes for passenger and freight gondolas, would carry many of the utilities now strung across the countryside on high wires. Salter said these underground power "lines" could be super-cooled with helium, like the electromagnetic loops in the floors of the gondolas. He said this would so reduce resistance that power could be transferred from one end of the country to the other without appreciable loss. At the present time long distance transportation of power is difficult because of the amount of energy wasted. He said laser beams could be carried in the tunnel for the instantaneous transmission of messages. Even the mail could go cross-country in pneumatic tubes carried in the tunnel. All this would save money and speed amortization, thus cutting the overall cost of tunneling. Salter said approximately 8000 miles of tunnel were dug in America and Western Europe in the 1960s. That includes mine shafts. But he said existing tunneling technology could be vastly improved. Salter said many tunnels are dug nowadays almost as they would have been in the dark ages. Drilling holes in tunnel faces, and using machines with rotary bits are methods of tunneling that can be improved, according to him. He said the tunnel could be worked on from a great many "faces," for instance. Salter suggested, too, that electronic beams or even water be used to drill holes for blasting. The high-powered electrons would drill blasting holes almost instantaneously. Projections of future airplane and automobile travels in the United States, and the future train and truck transfer of freight, show that Salter's tunnel idea is not a science fiction fantasy. There will be more room in the tunnels for all the necessary transport than there will be over any feasible number of Airways and freeways and tracks. Salter's suggestion, according to the experts who have had a look at it, is an eminently practical one for handling all the necessary traffic cleanly and without clogging up the air and surface pathways. But it will such a system ever be developed? Salter himself is not optimistic. "Perhaps" is how he puts it. "I am not nearly so optimistic about the political aspects of the problem as I am about our technical capability of doing the job." He said. "History shows that some obviously feasible and practical projects, such as the tunnel proposed over and over again for connecting England and France under the English channel, can be put off for centuries because of political pressure. On the other hand, societies with relatively primitive technology can perform such engineering feats as the erection of impairments." Is the VHS T too far out? Salter suggested that to get the right perspective we should look back 100 years. By comparing transportation a century ago and transportation today, one gets a better feel for just how practical VHST is. It appears to be a logical next step, and much more practical than its alternatives of filling the highways and Airways with more and more individually guided vehicles. "This alone is a compelling reason for the high-speed system." Salter said. There are others, according to him. "We can't afford any longer to continue indefinitely to pollute the skies with heat, chemicals, not to mention noise, or to carve up the land with pavement." He said. "We also need to get the trucks and many of the cars off the highway to make the roads available to drivers who drive the family car for fun and convenience."